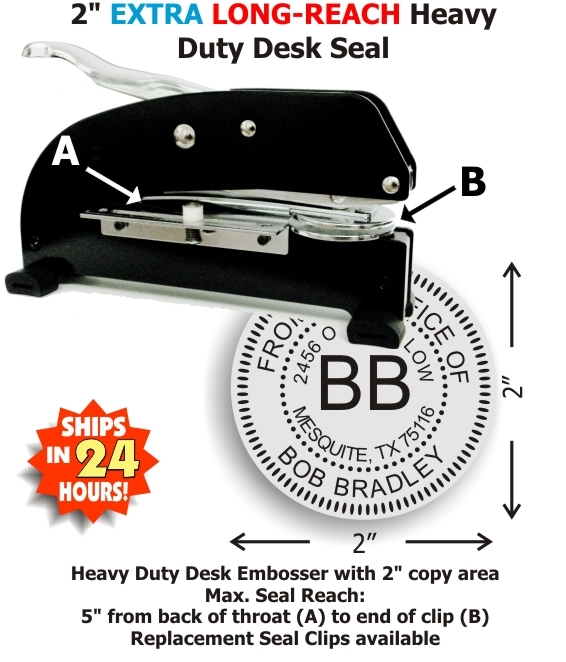 Our heaviest duty Desk Style EXTRA Long-Reach Embossing seal with online customization. 2in. diameter die plates (max. impression area). Extremely heavy guage metal and sturdy rubber feet provide a superior platform for high volume embossing jobs. The longest die holder available on the market provides the greatest possible leverage, which equates to a silky-smooth, easy to use unit that can handle extra thick paper with minimal effort. Add your own logo for an additional $40. EXTRA long-reach throat allows for an impression reach up to 4-1/2in. from edge of paper.